I introduced Jan van Eyck to my students about a week ago, but I haven't stopped thinking about him since. 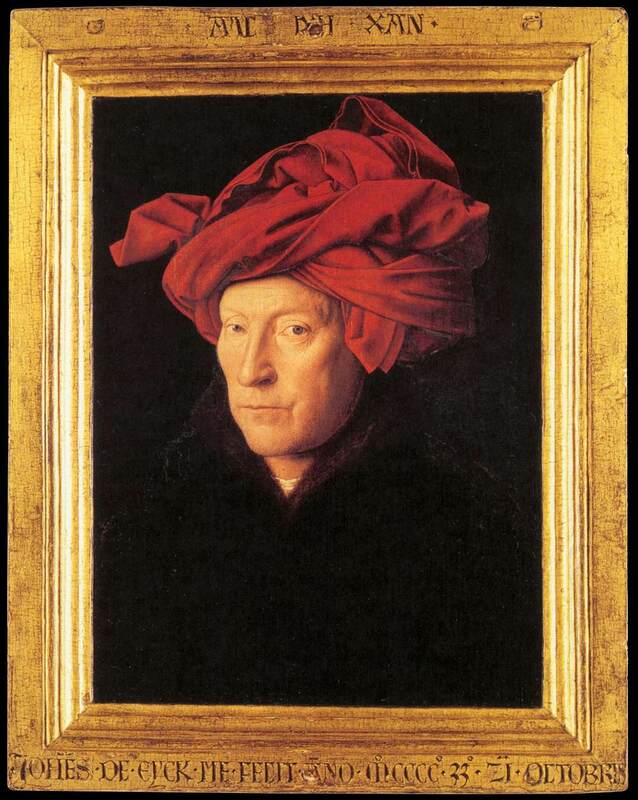 It's known that van Eyck (depicted in a supposed self-portrait, The Man with the Red Turban, 1433, on right) worked as court painter for Philip the Good, Duke of Burgandy. This position was extremely advantageous for van Eyck, and essentially helped the artist to develop an individual reputation (as opposed to many unknown artists, who were involved in collaborative artistic workshops which were regulated by the local guilds). We know a little about van Eyck's duties at Philip's court. For example, the artist was sent in an embassy which was charged with the duty of requesting Isabella of Portugal's hand in marriage to Philip. 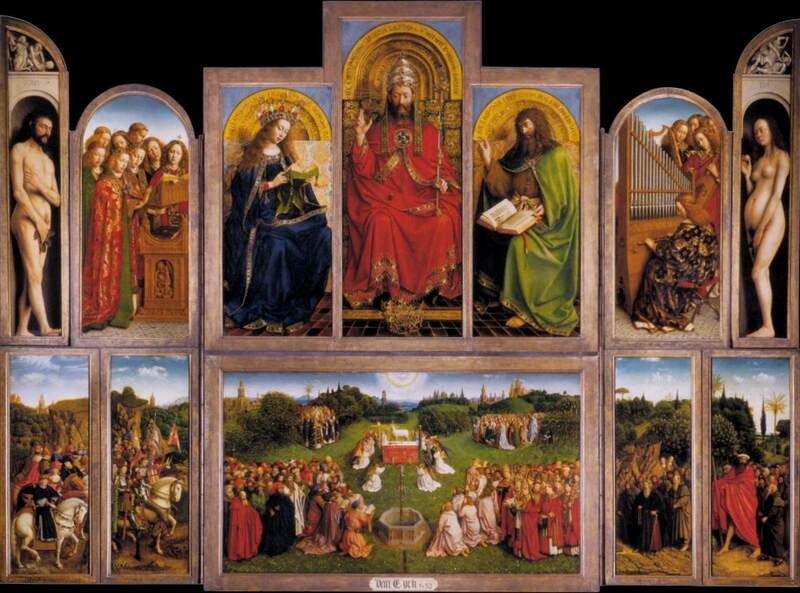 But I wish I knew more about the paintings that van Eyck produced for Philip the Good. Unfortunately, none of the paintings survive; the only extant works by van Eyck were produced for other, private patrons.1 (I assume that all of these Philip-the-Good-paintings were destroyed in the iconoclastic riots of the 16th century, but I have not come across a comprehensive discussion of how/why these works no longer exist. That being said - if anyone could point me to specific information on this topic, I'd be most grateful!). I also wish that we knew more information about Jan van Eyck's brother, the painter Hubert van Eyck. I think the paucity of information is rather surprising, given how much information is available about Jan. What do know, however, is that a "Master Hubert" was paid to paint panels in churches in both 1409 and 1413, and it seems likely that this painter is referring to Jan's brother (believe it or not, Hubert wasn't a terribly common name back then!). Wait - you're saying that you haven't ever heard of Hubert and his role in the Ghent altarpiece? I'm not surprised. With the "cult of the artist-genius" so prominent in art (and art history textbooks), it makes sense that people would shy away from (or ignore?) a discussion of Hubert. Mentioning any artistic collaboration would diminish the idea that Jan was a solitary master, a genius beyond equal. This idea ties in with my earlier discussion of Jef Vanderveken, the 20th century copyist who painted a new panel on the Ghent altarpiece (after "The Just Judges" panel was stolen in 1934). Poor Jef and Hubert. 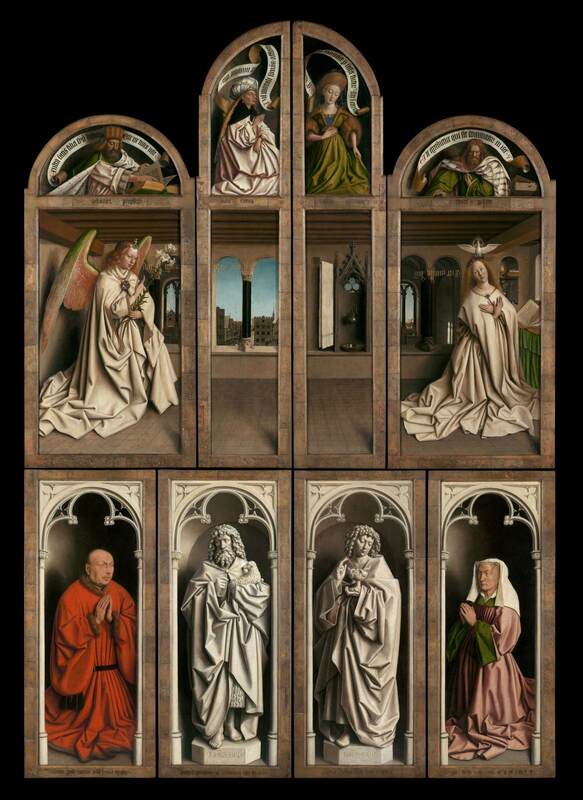 They both are relatively forgotten, having been lost in the mystic shadow which art history has cast for Jan van Eyck. 1 Kim Woods, "The Status of the Artist in Northern Europe in the Sixteenth Century" in The Changing Status of the Artist by Emma Barker, Nick Webb and Kim Woods, eds. (London: Yale University Press, 1999), 123. 2 Although some historians question the authenticity of the inscription (finding it to be a contemporary forgery), others assert that it is a "doubtless reliable inscription." See Anne Hagopian van Buren, "Eyck, van." in Grove Art Online. Oxford Art Online, http://www.oxfordartonline.com/subscriber/article/grove/art/T027196pg1, accessed 28 January 2011.